Cooking oil products sold in markets may have come from illegal refineries that process hundreds of tons of recycled kitchen waste daily from restaurants in Beijing, Tianjin and Hebei Province, the official Xinhua News Agency reported on Wednesday. An undisclosed number of pig farmers in suburban areas of Beijing buy kitchen waste from restaurants, separate the waste oil from hogwash, then sell on the waste oil and use the hogwash to feed their pigs, according to the Xinhua investigation. However, Beijing's sanitation, urban management, industrial and commerce, and quality watchdogs all claim they do not have the power to punish the illegal refineries, Xinhua reported. It is estimated that there are over 300,000 tons of kitchen waste produced daily in Chinese cities, and the number is increasing dramatically as the retail volume of the restaurant industry grows at some 21 percent annually. Illegal cooking oil comes mainly from three different sources, Chen Yongquan, a professor with the College of Food Sciences at the South China Agricultural University explains. The first is obtained from oil floats in sewage or kitchen waste, the second is refined from poor quality pork, and the third is cooking oil that has been repeatedly used. "Illegal cooking oil contains substances that are detrimental to human health, and can even cause cancer. Such products should not be used as cooking oil again," Chen said. "However it's still very hard to say how much of those products make their way back to people's dinner tables." Chen said the challenge of stopping illegal cooking oil from entering the food market lies in a lack of efficient ways of identifying which oil products are made from waste oil. Authorities in big cities are also failing to fulfill their duties in regulating the waste oil market. 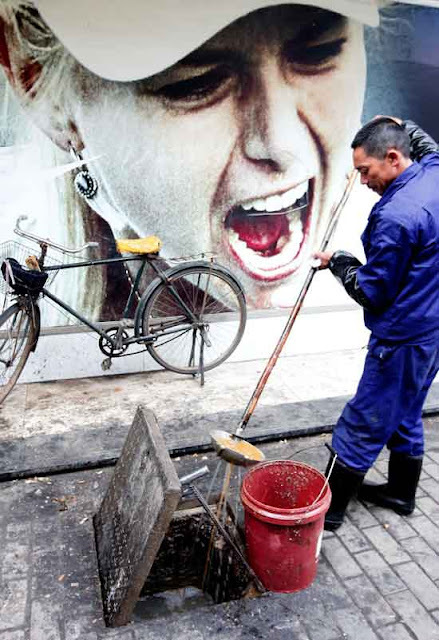 In Shanghai, a city that is home to over 50,000 restaurants, large-scale establishments (those over 700 square meters in area) sign service contracts with local sanitation departments and pay service charges to designated parties that retrieve kitchen waste, Jin Peihua, deputy secretary-general of the Shanghai Restaurants Association, told the Global Times. For a 1,000-square-meter restaurant, the owner would normally have to pay about 50,000 yuan ($7,730) to 60,000 yuan ($9,276) a year for the service. However, according to Jin, almost half of the restaurants in Shanghai are small-scale, and most of them don't work with local authorities to properly dispose of their kitchen waste. "We don't know where the waste from university or company canteens ends up," Jin said. Pursuit of profits is one of the fundamental reasons for this problem, which has been troubling authorities for years, according to Dai Xingyi, a professor with the Department of Environmental Science and Engineering at Fudan University. "It is unreasonable to have big restaurants pay for the disposal service," Dai said. "Restaurants can make profits by selling waste to lower scale or underground purchasers. Instead, they have to pay to use government-designated services." According to Dai's estimates, no more than 40 percent of the city's restaurant kitchen waste is dealt with properly. "Authorities are still not doing enough. They should make laws strict enough so that breaking them will cost people a lot. And law enforcement should also be thoroughly implemented," Dai said. Tianjin, for example, has a regulation stipulating that restaurants that do not dispose of kitchen waste properly face fines of up to 10,000 yuan ($1,546). "We know there are regulations and fines, but rarely do we hear about restaurants really getting fined." Factories that have the technology to process waste oil into biodiesel are also facing a shortage of raw material. The Shanghai Zhongqi Environmental Technology Company, one of two government-designated processing factories in Shanghai that have the capacity to process 40 tons of waste oil per month into biodiesel, currently processes less than 25 percent of its capacity. However, a city like Shanghai produces some 100 tons of kitchen waste every day. Yang Jianbin, technological director of the company, told the Global Times that the company has been short of waste oil sources since it went into operation in March 2009. The company needs to at least double its current operations to make a profit. "Our purchasing price is lower than some factories in neighboring Jiangsu and Zhejiang provinces, that's why although we work with the authorities, we still can't get enough raw materials," Yang said. "We are negotiating with the local government to pilot our own material-collecting network and hopefully resolve the shortage problem eventually."